Evita is a 1996 American musical drama film based on the 1976 concept album of the same name produced by Tim Rice and Andrew Lloyd Webber, which also inspired a 1978 musical. The film depicts the life of Eva Pern, detailing her beginnings, rise to fame, political career and death at the age of 33. 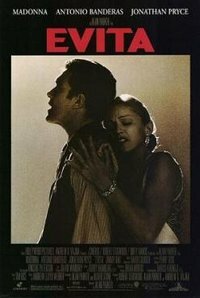 Directed by Alan Parker, and written by Parker and Oliver Stone, Evita stars Madonna as Eva, Jonathan Pryce as Eva's husband Juan Pern, and Antonio Banderas as Ch, an everyman who acts as the film's narrator. • Patti LuPone criticizes Madonna in 'Evita' -- She's a "movie killer"
This webpage uses material from the Wikipedia article "Evita_%281996_film%29" and is licensed under the GNU Free Documentation License. Reality TV World is not responsible for any errors or omissions the Wikipedia article may contain.